Factory Sealed 12 Box Hobby Case. Look for the hottest Young Gun Rookie in a decade - Connor McDavid. Every Box contains (1) Memorabilia Card, (6) Young Guns Rookies, and (4) UD Canvas Cards! 24 Packs Per Box / 8 Cards Per Pack. 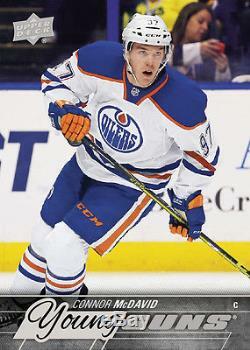 Look for Connor McDavid Rookie Cards! Uncover A Piece of History 300 Win Club Jersey and Patch cards along with 1,000-Point Club Jersey cards! Also look for UD Patch parallels, always a hit with #ing to just 15! Assemble the challenging UD Canvas Set! Highlighted by UD Canvas Young Guns, hitting 1 in 48 packs! Collect beautiful Clear Cut Acetate inserts! Highlighting Superstars, Foundations & Leaders with an update to the popular Clear Cut Honoured Members! Look for rare limited #'d Gold and Platinum Blue. Hobby Exclusive Shining Stars inserts! Falling Three Per Hobby box! Collect Centers, Left & Right Wingers and Legends! Find rarer Royal Blue parallels too! Young Guns - inserted 1:4. UD Canvas cards (combined to deliver 1:6). Regular Cards - inserted 1:6. Young Guns - inserted 1:48. UD Game Jerseys - inserted 1:24. A Piece Of History, 300 Win Club Jerseys - inserted 1:2,400. A Piece Of History, 1,000 Point Club Jerseys - inserted 1:2,400. UD Game Patch - #'d to 15. A Piece Of History, 300 Win Club Patch - #'d to 10. Signature Sensations - inserted 1:288. UD Canvas Signatures - Varied #. Shining Stars, Centers - inserted 1:16. Shining Stars, Left & Right Wingers - inserted 1:24. Shining Stars, Legends - inserted 1:48. Shining Stars Centers, Royal Blue parallel - inserted 1:48. Shining Stars Left & Right Wingers, Royal Blue parallel - inserted 1:72. Shining Stars Right Wingers, Royal Blue parallel - inserted 1:144. Clear Cut Superstars - inserted 1:360. Clear Cut Foundations - #'d to 25. Clear Cut Leaders - #'d to 10. Clear Cut Honoured Members Update - #'d to 100. Exclusives - #'d to 100. High Gloss - #'d to 10. UD Portraits Set (combined to deliver 1:6). UD Portraits - inserted 1:7.5. UD Portraits Legends - inserted 1:60. UD Portraits Rookies - inserted 1:60. UD Portraits Gold Parallel - #'d to 25. UD Portraits Legends Gold Parallel - #'d to 25. UD Portraits Rookie Gold Parallel - #'d to 99. UD Portraits Platinum Blue Parallel - #'d to 5. UD Portraits Platinum Blue Legends Parallel - #'d to 5. UD Portraits Platinum Blue Rookie Parallel - #'d to 25. The item "2015-16 Upper Deck Series 1 Hockey Hobby Factory Sealed 12 Box Case" is in sale since Sunday, April 23, 2017. 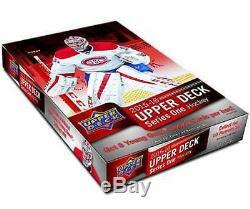 This item is in the category "Sports Mem, Cards & Fan Shop\Sports Trading Cards\Ice Hockey Cards". The seller is "sportscardsetcpgh" and is located in McKees Rocks, Pennsylvania. This item can be shipped worldwide.